You can gamble and drink all you want on the Las Vegas Strip. But you can't buy weed there -- even though it's legal in Nevada. The state voted last fall to legalize recreational marijuana, which means it will eventually be sold in stores like alcohol. But it's not for sale among the blinding marquees and glittering casinos of the Strip. Not now, and maybe not ever. "I don't think in the foreseeable future you are going to see the retail sales of any cannabis product on the Las Vegas Strip," said Chairman Steve Sisolak of the Clark County Commission. 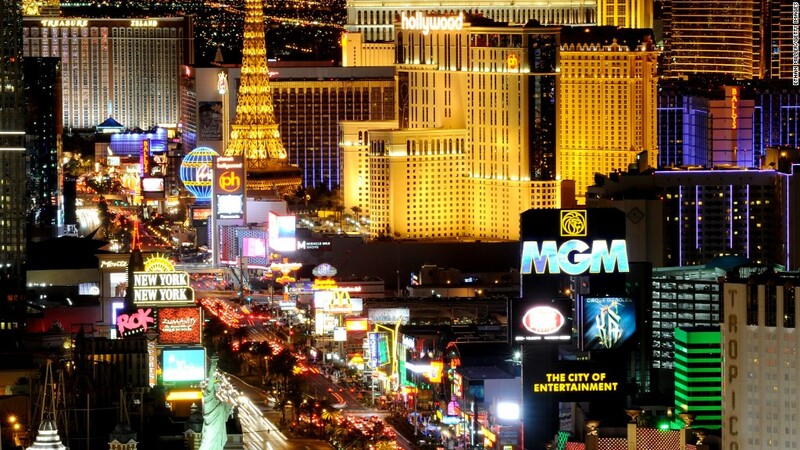 Many things are legal in Nevada that are not legal elsewhere: gambling and strip clubs, relatively loose restrictions for alcohol and guns, even prostitution. But the pleasures of Sin City are governed by specific rules. On what most people think of as the Strip, which is in Clark County but technically not the city of Las Vegas, it's legal to stroll by Caesars Palace or the Bellagio with an open beer or a cocktail. But strip clubs are not allowed on the Strip, even though they are advertised aggressively. Brothels are out in the desert, far from the city. Marijuana, the newest legal vice in this capital of vice, will also be kept separate, even when the state gets its system of recreational dispensaries set up. The zoning rules for Clark County don't allow dispensaries anywhere near a casino. Clark County has at least a dozen dispensaries parallel to the Strip, but they're at least several blocks away and nowhere in sight. In addition, the Nevada Gaming Control Board does not allow investors in the casino industry to invest in dispensaries, and vice versa. "You can't have both," Sisolak said. "If you have gaming, you can't have marijuana. If you have marijuana, you can't have gaming." The major Las Vegas casinos declined comment or did not return messages from CNNMoney. But Sisolak said he has spoken to casinos that "have questions as it relates to employees," and generally want to wait to see how legalization shakes out. "Right now they've made it clear to me they don't like it on Las Vegas Boulevard," he said. A.G. Burnett, chairman of the gaming board, said that after legalization his board informed the casino industry that marijuana "is still a federal crime, and gaming licensees should not be involved." In Las Vegas proper, off the Strip, zoning rules are less restrictive. The less traveled stretch to the north is home to the Stratosphere, a towering casino that looks like the Seattle Space Needle. Within its shadow are three medical dispensaries, including Las Vegas ReLeaf. "Right now, the zoning regulations are very conservative as to where you are and are not able to have a dispensary," said Jacob Silverstein, the marketing manager there. ReLeaf sells medical marijuana in many forms: sealed jars of buds, edibles, tinctures, oils, butters and bath salts, with plans to sell cannabis-infused coffee. He doesn't foresee marijuana ever being sold in a casino unless the federal government decides to rescind its ban. That's unlikely under President Trump's newly appointed attorney general, Jeff Sessions. The Obama administration mostly stayed out of the way of states that legalized pot, but Sessions is outspoken against it. Meanwhile, Silverstein and ReLeaf co-founder Ed Bernstein hope to start selling recreational cannabis by the summer, depending on how long it takes for state regulators to establish a framework. That's ambitious. Establishing a system for recreational sales could easily take more than a year from the time of the referendum in November 2016 to the day when adults without medical prescriptions will be able to buy marijuana legally in stores. That's the estimate from John Kagia, an analyst for New Frontier, a finance company that analyzes legalization. New Frontier projects that the U.S. market for legal pot could surpass $20 billion by 2020 and total more than 280,000 jobs. Nevada is one of eight states that have legalized recreational marijuana. It already had legal medical pot. Medical dispensaries started opening in 2015. The state now has 55, mostly in Las Vegas or surrounding Clark County. Kagia believes the recreational pot industry in Nevada will track Colorado, which also had an established dispensary infrastructure for medical marijuana before recreational pot was legalized in 2012. It still took 14 months for the first recreational dispensaries to open. Silverstein plans to expand his dispensary, and its cultivation facility on the other side of town, from 45 workers to 160. He said he expects the "wide-spread popularity" of legalization will triple or even quadruple his revenue. But Sisolak doesn't see it spreading to the casinos on his side of the Strip, in Clark County. "Right now, the attractions that are in Las Vegas are gaming and shopping and dining and a good time," he said.